1877 was the year of Carlton's Sixth Premiership, and our first in the Victorian Football Association (in just it's first year of the V.F.A. competition). Home Ground. Madeline Street Reserve, Melbourne University. Games Played. 21. Won 14. Lost 3. Drew 4. Honours. Champion of the Colony. George Coulthard. Goals. 56 for. 11 against. Since the late 1860's it was felt by everyone associated that a controlling body was needed. the Victorian Football Association (V.F.A.) was formed. The game required organising and the V.F.A. was formed at a meeting in Melbourne at Oliver's Cafe in Collins Street East, near Swanston Street on May 7. Carlton, Melbourne, Geelong, Albert Park, St.Kilda, Essendon, Hotham, Ballarat, Barwon, Beechworth, Castlemaine, Inglewood, and Rochester. They were the elite of the 133 Melbourne based clubs, and the 59 registered country clubs. The V.F.A. were given the power to control and manage all football in the Colony as well as inter-colonial football. It was to settle disputes, to suspend players for misconduct, and to rule on every matter associated with the game. Two delegates from each senior club made up the V.F.A., and they set about revising the rules of the game. Carlton's new ground at Madeline Street (now renamed Swanston Street) was beset with problems. Melbourne University at a meeting on June 18th., had decided that the reserve should not be used for playing football. Carlton had spent 300 pounds ($600) on the development of the ground, and still owed 130 pounds ($260). The University allowed the Blues to use the ground for 1877. Carlton and Melbourne had the only two enclosed grounds in the city. The Blues had to pay it's debt off as soon as possible. Carlton asked to charge admittance to it's home matches. The council in line with it's no football policy refused. Carlton raised 70 pounds ($140) by "taking around the hat" at a Melbourne game on July 14th. The following year 1878 would see Carlton without a home. The South Australian Football Association (now S.A.N.F.L.) challenged a Victorian side to be played at Carlton's home ground. Melbourne University refused admittance charges to be levied so the game was to be moved to Flinders Park. After arrangements were finalised, South Australia cancelled the visit. 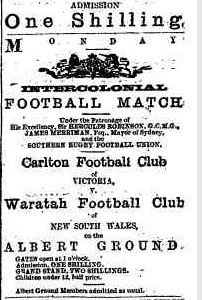 Carlton played a history making inter-colonial match against the Waratah Rugby Union Club in Sydney. First match on Saturday June 23rd. played under Rugby Union rules Waratah won 2 goals 3 tries to nil. played on the following Monday was easily won by Carlton 6-0. The games drew an attendance of more than 5000 to each game, a record for Sydney football. Members of the touring side to Sydney. John Gardiner (Capt.) George Coulthard, Alf McMichael , Loch J. Bracken , Joe H. Henry , Harry Nudd, John A. Turnbull , G. McGill , William Goer , Tom Kelly , Little , W. Dedman, Fred W. 'Paddy' Gunn , Adam Kennedy , T. Rickards , G. Smith, T. Nash, A. E. 'Topsy' Waldron , J. Melville, George Robertson, Ford, and Brooks. "Geelong has also displayed considerable efficiency, beating most provincial opponents, and also St. Kilda, although worsted by Carlton and Melbourne." This ladder is as published in The Australasian. The Junior's season review goes on to mention that after Hotham United, South Melbourne comes next, then Williamstown, Victorian Railway, Excelsior, Toorak, Warwick, Adelphian, Clifton, Brunswick, Northcote, Coburg, Sandridge, "and a host of others too numerous even to name." There are no Win-Loss details etc given for these teams. 1877. Premiers. Carlton, 2. Melbourne, 3. Hotham. Lost 2 Goals to Nil. Lost 1 Goal to Nil. Matches Played; 21, Won 14, Lost 3, Drawn 4. Goals For; 56, Against; 11. Joe H. Henry 9, W.Bracken 8, Coulthard 8, Loch J. Bracken 7, Jas. Rickards 5, A. McMichael 4, J.Turnbull 4, G. Robertson 3, Henry 'Harry' Nudd 2, W. Goer, B. Murphy, Adam Kennedy, E. Brookes, Tom Kelly and Alexander Ford 1 each. -(Note:1) Grounds on which these matches played, were very wet and sloppy and rendered abortive to all attempts at skilfull play. -(Note:2) A mixed team of First and Second players engaged Williamstown in this match, the Sydney team not having arrived up to the hour of play. -(Note:3) Carlton claim 2 more goals scored in this match; goals disallowed by the Hawthorn goal umpire. -(Note:4) Only 13 of regular 20 went to Geelong to play in this match. Carlton players complain very bitterly about two decisions of the central umpire, whereby their chances of kicking goals were nullified. -(Note:5) It was intended to play this match for the benefit of the Melbourne Hospital, but the Council of the University objected to a charge being made at the gates of the Reserve. Donation boxes were used and 62 Pounds approx, ($124) was collected. May. 26. V Melbourne Seconds, Won 2 Goals to Nil. June 02. V Northcote, Drawn 1 Goal each. June 16. V Keilor, Drawn 1 Goal each. June 23. V Victoria United, Won 4 Goals to Nil. July 02. V Albert Park Seconds, Lost 2 goals to 1. July 21. V Victoria United, Drawn 1 Goal each. Aug. 04. V Geelong Seconds,at Geelong,Lost 5 Goals to 2. Aug. 11. V Hotham United, Lost 2 Goals to Nil. Sept.01. V Melbourne Seconds, Lost 3 goals to Nil. Sept.15. V Brunswick, Lost 2 Goals to Nil. Matches Played; 10. Won 2, Lost 5, Drawn 3. Goals For, 12; Against, 18. Brooks 2,(Unknown) 2, Walter, Julius E. Petherick, Ford, Vail, Wishart, Kendell, Burrows, N.Muir. Following are the 1877 Carlton teams published in The Argus newspaper. Both the East Melbourne and Richmond Football Clubs are now defunct. Canning Street, Carlton Alma, Carlton Juniors, Carlton Union, Carlton United, Clyde, North Carlton, Rose of Carlton, Star of Carlton, Victory Union. Cricket: The very First Test Match is played between England and Australia on the M.C.G. Carlton footballer Tom Kendall is selected to play, becoming Australian Test Player No.9. Kendall scored 3 and 17 not out. As a bowler, the left hand leg spinner took 1/54 and then a match winning 7/55! The St.Kilda Cricket Club was in Albury playing the local team. 4,000 people attended the Catholic Picnic held on the Madeline Street Reserve. Amongst the entertainment was a football match, Carlton vs All-Comers which was won by the Blues. "While the East Melbourne cricketers were here they had some consversation with our leading football players, with a view to arranging an Intercolonial match in Melbourne during the present season. The Melbourne clubs are forming a Football Association, and the same plan might with advantage be adopted here." At the general meeting of the South Adelaide Football Club held on Tuesday April 17 a letter was read out. "A letter was read from Mr. T. P. Power, of Victoria, in reply to a proposal for an intercolonial football match to be played sometime this season, which stated that he (Mr. Power) had much pleasure in accepting, on behalf of Victoria, the South Australian challenge. The writer also remarked that he was acting in a pro tem. form for a Football Association which was to be formed in about three weeks' time, and that body would confirm the action taken by him." "A large meeting of gentlemen interested in football was held at the Prince Alfred Hotel, King William-street on Thursday evening, April 19, for the purpose of forming an Association; Mr Nowell Twopeny occupied the chair. Owing to the large number that attended, the meeting was very noisy, and got through but little business. It was however, unanimously resolved that the meeting should form the nucleus of a Football Association; and after some minor matters had been noisly discussed, a motion was passed that a meeting ofd two delegates from every Club in the colony be held at the Prince Alfred Hotel on Monday, April 30, at 7pm., Mr. G. D. Kennedy being appointed Secretary pro tem. of the Association, to whom Clubs are to send names of the delegates they have appointed to represent them." Classified advertisment in the Sydney Morning Herald (p1) about a meeting of the Southern Rugby Football Association to be held next Monday at 8 o'clock. "Business: to elect President and four Vice-Presidents, and to consider an invitation from the Victorian Football Association to send a team to Melbourne." As Robert Robertson and Harry Guy were both named first, Blueseum presumes they were the two captains. A Hurling match between 21 of the Hurling Club, and 21 made up of the Carlton Football Club and the Handball Club played on the Madeline Street ground. Coulthard and O.T.L. "Lanty" O'Brien were mentioned. Carlton's AGM was held at the Carlton Club Hotel. 90 members attended. Patrons; G. Coppin MP, Dr. J. C. Duncan, Mr. J. Curtain MP, Mr. T. C. Russell. Hon. treasurer & secretary; T. P. Power, assistant secretary J. Gardiner. Presentations of illuminated addresses were made to, J. Gardiner, A. Kennedy, T. Kennedy for services rendered and the respect they are held in. Messrs. Power and Robertson were given a vote of thanks. The Australasian's Peter Pindar writes about the coming season. Meeting of senior metropolitan clubs to form The Victorian Football Association at Oliver's Cafe. A draft of it's bye-laws and constitution was made out and several alterations to the rules of the game were suggested. The Association will control the management of all intercolonial matches, and all other matches, settle disputes, disqualify players for misconduct, adjudicate on any matter of the game, etc. Senior clubs will have one delegate to represent them. The distance between the goals to be not more than 200 yards. Width not to more than 150 yards measured from a line through the centre of the goals. Goal post to be 7 yards apart of unlimited height. The ball to a No.2 ball size 26 inches in circumference. Captains to toss for ends. The loser to kick off at the centre of the ground. Ends changed after half time break and the ball will thrown into the air by the field umpire in the centre of the ground. A goal must be kicked by one of the sides playing for goal between the posts without touching them or any player after being kicked. "Admirers of football will regret to learn that some difficulty exists regarding the renewal of the right accorded last season to the Carlton Football Club of playing on a portion of the University reserve fronting Madeline-street. It seems that the club has been saddled with a debt of £130, which has been incurred in affecting improvements on the ground, and that, not withstanding this fact, the members handed over the proceeds of one of the matches amounting to £115, to the Melbourne Hospital. The council of the University are adverse to any charge being made for admission to the playing ground, and the club are willing to abandon the gate money so soon as their liabilities have been wiped off. They intend, however, with the leave of the senate, to make a charge once a year for the benefit of the Melbourne Hospital, and it must be confesssed that there does not appear to be much of self seeking in their proposals. Meanwhile the club has addressed a circular to the council of the University setting forth the facts of the case, and it is to be hoped, in the interests of this popular winter pastime, that that body may yet see fit to review the decision it has arrived at." See Pre VFL Venues and scroll down the page for an article on this dispute. "A meeting of the Carlton Football Club is called for this evening, at the Carlton Club Hotel, to farewell an old member." May 24 Thursday Queen's Birthday. Carlton played Ballarat on the Saxon ground, Ballarat. Crowd enroachment was a problem some players knocked over some onlookers. A well contested match, neither side scored a goal. Afterwards both teams were entertained at the Stork Hotel and the Carlton players departed at 7pm for the railway station. R. Amess, L. Bracken, G. Coulthard, J. Cooper, R. Donaldson, Gardiner, Goer, Henry, Kelly, Kennedy, McGill, McMichael, McSweeny, Murphy, Rickards, G. Robertson, J. Robertson, Smith, Turnbull, Waldron. Bracken, Coulthard, Drake, Gardiner (Capt. ), Goer, Guy, Henry, Kennedy, Lewis, Lewis*, Macgibbon, McGill, Murphy, Prevot, Rickards, G. Robertson, J. Robertson, Smith, Turnbull. * Lewis named twice, a misprint? Players mentioned; (9) Coulthard, McGill, Murphy, G. Robertson, Goer, Turnbull, Gardiner, Bracken, Kennedy. Carlton played West Melbourne (25) at Royal Park. West Melbourne had most of the play, but the game ended in a draw. R. Amess, L. Bracken, Coulthard, Donaldson, Gardiner, Goer, Gunn, Henry, Kelly, Kennedy, Murphy, Macgibbon, McGill, McMichael, Prevot, G. Robertson, J. Robertson, Rickards, Smith, Turnbull, Waldron. Carlton Reserves played Melbourne Reserves at the Melbourne ground. Carlton (16) played Victorian Railways (18) at the Madeline Street ground, Melbourne University. The reserve "was in excellent order, the picket fence being set up around the playing space of 200 x 130 yards, last year's enclosure deemed a little too wide, and the new goal posts 30 feet high, rearing their proud heads to the gaze of an admiring crowd." Only 18 of the 23 Railway players turned up. "Why in the good old days, the days of holding the ball, and "sacks on the mill," the days of Harrison and Conway, of Freeman and O'Mullane, of Gormans and Fleming, and other doughty knights, half a dozen goals in a season were considered a great achievement; but then there were no Railways!" W. Bracken, Coulthard, Donaldson, Forde, Gardiner, Goer, Gunn, Henry, Kennedy, Kelly, McGill, McMichael, Murphy, Monie, Nudd, G. Robertson, J. Robertson, Richards/Rickards, Turnbull, Waldron. Goals; W. Bracken 5, Goer, Coulthard, McMichael, Rickards, Turnbull. Carlton Reserves played Northcote at Croxton Park, Northcote. "The Carlton Football Club is unfortunately placed in a very awkward position, owing to an objection raised by the City Council to the club making any charges at the gates. The ground was originally granted by the Crown to the Roman Catholic body for college purposes, and the Carlton Football Club having obtained permission from the archbishop to play upon it, expended upwards of £400 in improvements. At a few matches during the year a charge has been made for admission, a portion of the funds being devoted to the reduction of the debt, and the balance handed over to the charities; thus no less than £115 was paid to the Melbourne Hospital last year. There remains a debt on the improvements of £130 chargeable to the club, who also have an engagement with the Adelaide club to play towards the end of June, and now the ground is now closed practically closed against them, they are left in the most unenviable position, as permission cannot be obtained to charge for admission, except for purely charitable purposes." "for permission to charge at the gate of the Madeline street reserve in important matches, to liquidate the debt incurred in improvements, and also any expenses that may be gone into in connextion with intercolonial matches." It was supported by a letter from the secretary of the VFA, and by other prominent residents of the area. Carlton played Melbourne at the Melbourne Cricket Ground. This is possibly the first time that the Australian game was NOT played on a rectangular playing field. The Australasian said that this was the 41st. meeting between these two clubs. Football had been excluded from cricket grounds, and this was the first time in many years that a game was played on the M.C.G..
Melbourne's home games were played on the Metropolitan football ground, (the "gravel pit") which was adjacent to the M.C.G. Who "behaved in a much more exemplary way than usual." Gate takings £200 ($400) were split between the M.C.C. and the M.F.C. for improvements to the cricket ground and for fencing the football ground adjacent to the M.C.G. The M.C.C. pocketed a tidy £100/6/2 ($200.62). The Blues?, well, they received the pleasure of playing on the "hallowed turf". The reporter said it was clearly obvious which is the more popular game, "Who ever heard of such an attendance at a club cricket match - cups given in?" Cricket clubs should take note and let the footballers onto their grounds especially in June when the ground is softer. The playing surface was very soft and players had problems turning without slipping, unlike the drier football ground surfaces. Players were not allowed to have nails or spikes protruding from their boots. The Carlton players who play on turf at Royal Park adapted better to the conditions. The goals were pitched across the ground, one being just below the bowling reserve fence, and the other 50 yards from the grandstand, and the boundary on each side was the whole width of the ground, which was too much, being over 150 yards instead of the 100 yards usually considered a proper width. The Argus reporter said the extra width spoilt the game and made it too scattered at times, and not as exciting when the players were close together. "From a player's standpoint, however, it was by no means so good or pleasant; the playing space-the entire cricket ground circle-being so wide as to give every man a larger area to cover, and the grassy turf so slippery as to render playing a great difficulty and labour...."
The spectators saw perhaps the finest game ever witnessed. At the M.C.G. they now had the advantage of being able to view all of the game from the stands and other vantage points. "The goals were pitched diagonally across the ground, one being just beyond the bowling green reserve fence, the other about fifty yards from the end of the stand. Bounds had not been marked off, the rink being made the boundary all round, and the play was therefore much too straggling, as in the widest part it spread over 150 or 160 yards." The game finished in near darkness at 5.20pm., The Age reporter said; "So it may be imagined how dark it was, and a very peculiar effect was produced by spectators here and there around the rink lighting matches for smoking purposes, the murky atmosphere making them look like so many lanterns bought for the purpose of illuminating the ground." The team met at Cavanagh's Hotel at 2pm. Gardiner won the toss and kicked to the bowling green end. L. Bracken, W. Bracken, Coulthard, Donaldson, Ford, Gardiner (Capt. ), Goer, Gunn, Henry, Kelly, McGill, McMichael, Monie, Murphy, Nudd, Rickards, Robertson, Robertson, Smith, Turnbull, Waldron, Kennedy. Waldron and Kennedy did not play. L. Bracken, W. Bracken, Coulthard, Donaldson, Ford, Gardiner (Capt. ), Goer, Gunn, Henry, Kelly, McGill, McMichael, Monie, Murphy, Nudd, Rickards, G. Robertson, J. Robertson, Smith, Turnbull. Best; McGill (BOG), McMichael, Goer. Players mentioned; (17) L. J. Bracken, W. Bracken, G. Coulthard, J. Gardiner, Goer, Gunn, Henry, McGill, McMichael, Monie, Murphy, Nudd, Rickards, J. Roberston, G. Robertson, Smith, Turnbull. "It was a long time before the cricket clubs allowed football teams to play on their grounds, but once they found what a difference it made in the revenue the committees were ready to agree that football did not necessarily "ruin the ground." The Melbourne Cricket Club had only a small wooden pavilion and 178 members when the Melbourne and Carlton football teams met for the first time on this ground. Next year the membership increased to 800. The M.C.C. could thank the football clubs for the splendid grandstands which had superceded the wooden structure in existence when the old football rivals met in 1876*."
. * Although 1876 is mentioned, Blueseum believes that this 1877 match was the first occasion a match was played on the cricket ground. A letter to The Australasian from a person who witnessed the players slipping over at the Carlton-Melbourne match suggested the players attach leather strips to their boots. "The remedy I mean is having three slips of leather, about 3/4 inch broad, and 1/8 inch thick, tacked obliquely to the sole. I have had my boots so for two or three seasons, and always found it most useful, even on very slippery grounds." "It was tried successfully at the Carlton Club sometime back, but has fallen into disuse, and some of the most severe wrenches and sprains happen through slipping, it would be well if all players would adopt this very simple precaution." The Blues were cool in a crisis and a most effective team. Rickards' brother was playing for Albert Park. The Parkites had quite a few players from the old Carlton Imperials, who were filling the gaps left by players going to North Melbourne. The report mentions the difficultly the umpire had with the new rules introduced this year, and missed quite a few free kicks that should have gone to Carlton. Murphy kicked the first goal from a running drop kick, in fact, all of Carlton's goals were scored on the run. W. Bracken, Coulthard, Donaldson, Ford, Gardiner, Goer, Gunn, Henry, Kelly, McGill, McMichael, Monie, Murphy, Nudd, G. Robertson, J. Robertson, Richards/Rickards, Smith, Turnbull, Waldron. Carlton Reserves/Second Twenty played Keilor at Madeline Street. Baines or Barnes, Bell, Brendell, Brookes, Brooks, Cooper, Drake, Knowles, Lewis, Long, Muir, Moody, O'Brien, Petherick, Prevot (Capt. ), Prunty, Robin, Rodgers, Sidley, Spencer, Sutherland, Todd, E. Walters, Wishart. Best players; Brendell, Lewis, Knowles, Prevot. The Age wrote about Carlton's use of the University Reserve. "There were last year, according to, the Footballer, fifty Football Clubs, containing over 3,500 members, in Melbourne and its suburbs, besides sixty-seven country Clubs in the rest of Victoria. Moreover, I have learnt from Mr. G. D. Kennedy, the late captain of the celebrated Carlton Club in Melbourne, that in the last fifteen years no fatal accident has occured amongst all the Melbourne and suburban Clubs. Yet the rules played there are the same as those played here now." The Carlton football team arrived in Sydney between 11pm and 12 midnight on the S.S. Barrabool. W. Bracken, L. J. Bracken, G. Coulthard, J. Lewis, E. Spencer, G. Drake, J. Gardiner, W. Goer, J. Henry, Tom Kelly, A. E. 'Topsy' Waldron, B. Murphy, W. Monie, H. Nudd, O. O'Brien, G. Robertson, James Robertson, James Rickards, G. Smith, E. Prevot, John A. Turnbull, E. Walters. Carlton Second Twenty played Victoria United on the Madeline Street Ground. Goals; E. Brooks 2, Ford, Vale. Best; Gunn, Donaldson, Ford, and Knowles. The Leader wrote about Carlton's dealings with the Roman Catholic College, trustees of the Madeline Street ground. Carlton played Waratah at the Albert Cricket Ground, Sydney N.S.W. The Blues had tried to pick up the finer points of the Rugby game on Thurday and Friday without the benefit of a coach. "The mysteries of "on side, off side, touches down, and tries at goal," would puzzle our players..."
The match was played under Rugby rules, 15 players in each team. The physique of the two teams differed, Carlton "small and thick set", while the Waratahs were "tall and wiry." Crowd; 3,000; the largest crowd to attend a football match of any kind in Sydney. The "Dark Blues" found the rugby game difficult to adapt to with the off side rule and the cramped style of play. At one stage 23 out of the 30 players were piled on top of one another in a scrum. The Blues gave a great exhibition (the best seen in Sydney) with their drop kicking skills for distance and accuracy. W. Bracken, L. J. Bracken, G. Coulthard, J. Lewis, E. Spencer, G. Drake, J. Gardiner, W. Goer, J. Henry, Tom Kelly, A. E. 'Topsy' Waldron, B. Murphy, W. Monie, H. Nudd, O. O'Brien, G. Robertson, J. Robertson, J. Rickards, G. Smith, E. Prevot, John A. Turnbull, E. Walters. J. Henry, J. Turnbull, backs; T. Kelly, H. Nudd, quarter-backs; W. Monie, J. Gardiner (Capt.) half-backs; W. Bracken, W. Goer, G. Coulthard, B. Murphy, G. Robertson, J. Robertson, G. Smith, A. Waldron, J. Rickards, forwards. Umpires; H. M. Prior, and E. Powell. Players mentioned; (9) Gardiner (Capt), Rickards, Monie, Coulthard, Henry, Murphy, Bracken, Robertson, Nudd. Former Carlton champ "the little wonder" W. 'Bill' Newing played well for the Waratahs. Carlton Second Twenty played Victoria United on the Carlton Reserve. ADOPT RUGBY? - NOT LIKELY! The Australasian's football writer Peter Pindar replied to a letter by "Merrivale." "Merrivale" criticised Australian Football and said that Victoria should adopt the Rugby code. 1. "Messrs. Hammersley, Wills, and Thompson who were all old Rugby Union men - the most conservative in the world - and drew up our rules fully alive to all the advantages and disadvantages of their old game, and would not have been likely to put it aside without grave deliberation. 3. Because our game is so firmly established and so highly esteemed that it is now too late to attempt to bring about such a radical change as the proposal would involve. 4. The progress which it has made and the success which has attended our game - I repeat it - our game - are unprecedented in the history of football, and afford the strongest testimony to it's inherent excellence. Look at the number of our players and also at the number of spectators at any important contest; why, we have more onlookers - and paying ones too, as the last match showed - at any Melbourne and Carlton match than they have at an annual international match in England, where there are 20 people to every one here; while in New South Wales and New Zealand, under the R.U. rules, the players are not proportionately nearly so numerous, nor do the public evince any great interest in the matches." "The council of the University on Monday last came to the conclusion that the Madeline-street reserve - otherwise the Carlton football ground - could "not with propriety be used" for playing football on. I don't know which of the proprieties is most likely to be outraged by the incidents of the noble game, or whether the dulcet tones of the larrikin voice from the same enclosure would be sweeter to the sensitive ears of the University inmates; but I certainly hope the matter will not be allowed to end here." Futher information on the dispute at the Madeline Street ground can be found at Pre VFL Venues, scroll down towards the end of page. 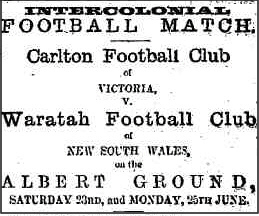 Carlton played the Waratah at the Albert Cricket Ground, Sydney N.S.W. This match was played under Australian Football rules. W. 'Bill' Newing captained the Waratah club, their colours being dark blue and red. The Blues were rarely troubled by Waratah, infact it was a reverse of the previous rugby game with both clubs being unfamiliar with the rules and nuances of the game. "As we pointed out yesterday, the Victorian game differs essentially from that played here, and gives much more scope for the vigorous enjoyment of football than the Rugby game; and although the play yesterday was, to a great extent, one-sided, it was evident that, from a spectators point of view, it was much more edifying than Saturday's performance. The players, under the Victorian rules, not being permitted to hold the ball when tackled, no scrimmages take place; and as the area of the ground is not confined within touch or goal lines, and the ball is thrown in from bounds by an umpire, the time lost in resuming play is extremely limited. The ball, too, has simply to be kicked between the goal posts to score, and although this is considered by many persons as a drawback, it nevertheless simplifies the game materially." L. J. Bracken, W. Bracken, G. Coulthard, J. Gardiner (Capt), Goer, J. Henry, T. Kelly, Monie, J. Lewis, Murphy, Nudd, O'Brien, Prevot, Rickards, J. Robertson, Robertson, E. Spencer, Smith, Turnbull, Walters. Goals; Rickards 2, Bracken(s) 2, Coulthard, Henry. Players mentioned; (20) L. J. Bracken, W. Bracken, G. Coulthard, J. Gardiner, W.Goer, J. Henry, J. Lewis, Kelly, C. Monie, Murphy, C. Nudd, Lanty O'Brien, E. Prevot, Rickards, G. Robertson, J. Robertson, Smith, Spencer, Turnbull, Walters. After the match the Blues were entertained by the Waratah Club at Hook's Hotel. The Carlton football team took a rail trip to visit the Zig-Zag railway in the Blue Mountains. The Carlton football team departed Sydney for Melbourne on board the steamer "You Yangs". The Australian Town & Country Journal (N.S.W) reported in detail on the two Sydney matches that Carlton played. The Carlton football team arrived in Melbourne on board the 552 ton S.S You Yangs. Carlton played Williamstown at Madeline Street Carlton. The match was fixtured was to be a Carlton 20 against a Williamstown 25, however, Williamstown put 21 onto the field. A large crowd had assembled but were disappointed that the Carlton team had not returned from Sydney. However McGill the vice captain put together a team made up of those who did not make the trip and some ex players and reserves/second twenty men. Former players were Donovan, Guy, Blanschard, McGibbon and the two Kennedys. The rest of the vacant places were made up of reserves players. Brendell, H. Boyle, Blanshard, H. Bannister, E. Brookes, Donovan, Dismorr, Donaldson, Ford, Guy, Gunn, Gibbons/Macgibbon, Kendall, T. Kennedy, Adam Kennedy, McGill, McMichael, McNeil, McGibbon, Nash, Page, Julius E. Petherick, Todd, Williams, Williamson. Goals; Adam Kennedy, E. Brooks. Players mentioned; (10) Donovan, Guy, Blanschard, McGill, Ford, E. Brooks, Adam Kennedy, T. Kennedy, McMichael, Macgibbon. Carlton Reserves played Clifton at Carlton. Bell, Brooks, Brendall, Brian, Cooper, Donovan, Drake, Knowles (Vice Capt. ), Long, Lewis, Moody, Muir, Muir, Prevot (Capt. ), Petherick, Prunty, Robin, Rodgers, Sutherland, Spencer, Siddeley, Walters, Woods, Wishart. Victoria was to play South Australia on Carlton's Madeline Street ground. This match was cancelled because the University refused to allow a charge to made for admission. There was no other ground available. The VFA rescheduled the match to the Civil Service Cricket ground on July 21, but the South Australian Association wanted the game played in the 14th. The South Australians then changed their minds and decided they did not want the game to go ahead. Carlton played Hotham at Madeline Street Carlton. No charge for admittance, however donation boxes were placed outside the ground. Nearly 45 minutes was lost before the game commenced. The Carlton players amused the crowd with funny illustrations of the Sydney game. Fuhrhop the captain of Hotham won the toss and kicked to the southern end goal. They attacked for most of the first half, but could not score a goal. Carlton on the other hand, had the ball in their scoring area a few times and scored two goals before half time. After a half time break of 15 minutes, the ball was thrown up to commence the second half. In the second half the Blues had the benefit of the wind and in kicking longer, put Hotham on the defensive. The best kick of the day was by Ford, and McMichael made a run of 70 yards. Only two "little marks" were made throughout the match. The 5-0 result was Carlton's biggest win against a senior team. Billy Lacey's brother debuted for Hotham. L. Bracken, Coulthard, Donaldson, Ford, Gardiner, Goer, Gunn, Henry, Kelly, Tom Kendall, McMichael, Monie, Murphy, Nudd, G. Robertson, J. Robertson, Rickards, G. Smith, Turnbull, and Waldron. Players mentioned; (15) Gardiner, Coulthard, Henry, L. Bracken, George Smith, Turnbull, Gunn, McMichael, Ford, McGill, George Robertson, Kelly, Donaldson, Goer, Monie. Carlton Reserves played Albert Park at Albert Park. The team met at Cavanagh's Hotel, Swanston Street, at 2.15pm. Bell, Brendall, Brooks, Brooks, Burton, Cooper, Drake, Donovan, Knowles, Lewis, Muir, Moody, O'Brien, Petherick, Prunty, Prevot (Capt. ), Robin, Rodgers, Sidley, Sutherland, Vail, E. Walters, Wishart, Woods. "The growth of this sport in popular estimation is shown by the large attendance of spectators at Saturday matches. To the interest taken by the public in football may all improvement in play - the substitution, for example, of skill for roughness, which by the end of the present season will be reduced to a minimum - be directly traced. Now, however, that spectators muster in thousands, the players find them often a serious obstruction. None of the metropolitan clubs possess a ground which they can call thier own. The Carlton Club, which has been deprived of the power to levy a charge at the portion of the University-reserve of which it has had the use for some time, and now almost of the right even to play there, resorted on Saturday last to the novel plan of placing an offertory box at the gate, with very fair results. The money was needed to help the club to clear off the debt it had incurred in the erection of fences. By united action the metropolitan clubs might obtain the use of a suitable area in a central locality for important matches. The proceeds of a few contests would soon clear off the cost of improvements, and fund might be formed to defray the expense of intercolonial matches. The portion of Yarra-park occupied by the Melbourne ground is situated on a slope, and the times that the ball spends out of bounds must amount in the aggregate to half or three quarters of an hour very afternoon. The next great match of the season will be played on Saturday next, on the Civil Service cricket ground. The clubs interested (Melbourne and Carlton) ought to see that the grass in well mown by then." The Carlton Football Club held a special meeting at the Clyde hotel Cardigan Street. Probably to discuss the use/non use of the Madeline Street ground. "Mark" wrote to the editor of the Herald. "...in order to avoid the crush that took place at the gate of the ground on the occasion of the last football match between the Melbourne and the Carlton clubs, the committee should arrange for some places in the city where tickets could be sold beforehand." "The football match between the Melbourne and Carlton clubs to-morrow will be played on the University reserve, and not the Civil Service cricket ground, as first imtimated. The committee of the Carlton club found that considerable expense would have to be incurred before they could render the cricket ground completely available to themselves and the public. They have, therefore, determined to resort for a second time to the offertory box, to raise the funds that they stand in need of. The last time these clubs met, Carlton got the best of encounter by one goal." The Civil Service ground, also known as the Scotch College ground, was in Richmond Park over the rail line opposite the MCG. It is now part of the Tennis Complex. Carlton played Melbourne at Madeline Street Carlton. Crowd; 6,000 Another report said 10,000. The above article indicated that this match was to be played on the Civil Service cricket ground, however, it was played at Madeline Street. The game started at 3.10pm. sufficiently late to show the need of a clock at the ground. £70 was taken at the gate which will help towards paying off Carlton's debt incurred in improvements to the ground. The Blues stunned the opposition and the spectators with their brilliant 90 yard runs while bouncing the ball. Their coolness in their use of little marks allowed the Blues to maintain possession while surrounded by Melbourne players. Since the Hotham match last week the Blues seemed to play as a well drilled team, rather than as individuals. After 15 minutes Rickards kicked the first goal, the ball striking the goal umpire full in the face. The Blues celebrated the goal with nineteen Carlton players throwing their caps into the air, the twentieth player performed three somersaults! Like most clubs, charging for admittance was a problem as the clubs did not control the grounds. Carlton was no different, as the Melbourne University owned the Madeline Street ground, and the Blues owed a considerable sum for the improvements they had made to the ground. The Age writer commented on Carlton Hon.sec; T. P. Power's foresight in placing chairs for the press inside the fence for an unimpeded view. Murphy's forward play and McMichael's rushes were the highlights of the first half. 10 minutes after the start of the second half Melbourne were not in the game. They were beaten in all departments of the game, except for kicking. Gunn's superb wing display, Gardiner and Goer's brillant runs, and Coulthard's matchless rushes dominated the second half. The Australasian said the 4-0 defeat of Melbourne is the greatest margin between these two clubs since they first played in 1866. L. Bracken, Coulthard, Donaldson, Gardiner, Goer, Gunn, Henry, Kelly, Tom Kendall, McGill, McMichael, Monie, Murphy, Nudd, G. Robertson, J. Robertson, Rickards, Smith, Turnbull, Waldron and Ford. Goals; Bracken 2, Rickards, McMichael. Best; Paddy Gunn (BOG), Murphy, Alf McMichael. Players mentioned; (20) Murphy, Turnbull, Bracken, McMichael, Rickards, Henry, Gunn, Gardiner, McGill, Coulthard, Donaldson, Goer, James Robertson, Waldron, Monie, George Robertson, Nudd, Kelly, Smith, Kendall. Peter Pindar writing in the Australasian said this of Carlton's Madeline Street problems. "The Victorian public is one of the most liberal in the world. This may appear good honest blow, but it is also good honest truth; for letting "the dead past bury it's dead" and looking only at the "living present," I would ask what other part of the dominions of Her Most Gracious Majesty would contribute freely and voluntarily such a sum as that given at the Madeline-street reserve gates last Saturday, to countenance athletic sports? Fancy £70 being cheerfully and willingly dropped into the boxes? What stronger or more practical testimony could be given by the public to show that they have no sympathy whatever with the recent action of the dons of the Alma Mater in regard to the reserve? The Carlton club may go on it's way rejoicing in the knowledge that the treatment it has met with in high places and not been in any way countenanced or supported by the general public, and it's efforts to improve the tone of the game have neither been misunderstood nor unappreciated by those who take interest in the manly sport." Carlton played St.Kilda at St. Kilda. The team met at Cavanagh's Hotel, Swanston Street at 2pm. Chas. Cavanagh was a Carlton member who provided a trophy for the 1874 Carlton Sports Day. Blueseum is unsure if he was a former player. A one sided match in which the Blues easily accounted for St.Kilda. The match "from first to last, a series of shots, - some drop, some place, some punt kicks at every conceivable distance, position, and angle - for goals, which sometimes were got and more times were not. The monotony of the entertainment was relieved at times by a game at leapfrog by the St.Kilda forwards and the Carlton backs, which was doubtless amusing to both, though perhaps only satisfactory to one." Coulthard and McMichael provided some good runs which were appreciated by the reasonably sized crowd. Bracken, Coulthard, Donaldson, Ford, Goer, Grey, Gunn, Henry, Kelly, Kennedy, Kendall, McGill (Capt. ), McMichael, Murphy, Nudd, G. Robertson, J. Robertson, J. Rickards, Smith, Turnbull, Waldron. Goals; Coulthard 3, Henry 2, L. Bracken, McMichael. Melbourne played Hotham on the Madeline Street ground, courtesy of the Carlton Football Club. Carlton Second Twenty played Victoria United on the University Paddock. Brendall, Brooks, Brooks, Boston, Cooper, Donovan, Hemous/Hemons?, Knowles, Lewis, Moody, Muir, Muir, Petherick, Prunty, Prevot (Capt. ), Robin, Rogers, Roffey, Sidley, Sutherland, Vail, E. Walters, Wishart, Woods. "What crowds rush off to football matches. Last Saturday 10,000 spectators witnessed Carlton v Melbourne, on the Madeline-street Reserve, to the north of the city. The excitement is immense on such occassions. Ten years ago the match would not drawn more than fifty to look at it. The Madeline ground is unsurpassed in the world for football. About six acres are enclosed for the players, and the whole space is as level as the floor. This is the Carlton club's ground. The Melbourne club's is in Richmond Park, south-east of the city, and adjoining the north side of the Melbourne Cricket Ground. The grandstand on the Cricket Ground has the seats constructed to that in summer they face the cricket, and in winter the football. The latter game, as now played under amended rules, has lost much of its savagery. There are about eighty football clubs around Melbourne. A dozen of the leading clubs have their registered colors. Knickerbockers, which would have been laughed out of the place three years ago, are quite common at the present day. They are indispensible to a real footballer. The game appears to beget a rough spirit in those attached to it, and it apt to get mixed up with beer. There have been no serious accidents reported in Victoria this season, although it has already resulted in two deaths in other colonies. The new rules seem to be efficacious." Carlton played Geelong at Madeline Street Carlton. Geelong arrived by the morning train and were entertained at the Clyde Hotel by Carlton president R. Robertson. After lunch they proceeded to the Madeline Street ground. The donation boxes were again in use to help Carlton pay off their debt. The ground was in perfect condition, however the strong northerly wind blew directly down the ground. Gardiner lost the toss and Geelong had the use of the wind in the first half, but failed to score. They missed at least three easy chances from 20 yards. Carlton had the better of the Pivotonians in the second half, with ball not venturing far over the half way mark. L. Bracken, Coulthard, Donaldson, Ford, Gardiner (Capt.,) Goer, Gunn, Henry, Kelly, McMichael, Monie, Murphy, Nudd, G. Robertson, J. Robertson, James Rickards, Smith, Turnbull, Waldron, J. Donovan. Players mentioned; (17) Gardiner, McMichael, Rickards, Murphy, Kelly, Gunn, Bracken, Henry, Nudd, George Robertson, Donovan, Coulthard, Monie, Waldron, Turnbull, Smith, Goer. Bell, Broach, Brindle/Brendall?, Brooks, Brooks, Cooper, Donovan, Knowles, Lewis, Moody, Muir, Muir, Prunty. Prevot, Robin, Roffey, Sidley, Sutherland, Vale/Vail, E. Walters, Wishart, Woods. A 71 year old man from Brunswick was returning home from watching the football north of the University. He was a fit and active man and was quite familiar with the area. He was returning at about 6.30pm and in the darkness missed the track and fell striking is head on a rock and drowned in the water in one of the quarrys. Carlton played Albert Park at the Madeline Street ground. Another strong northerly wind was blowing down the ground and the Alberts kicked with it. Gardiner kicked off to to the northern goal at 3pm. The Blues in the second half had plenty of opportunities to add to their score. "The game during the second half was so much in favour of Carlton as to be divest of any great interest and if they did not score half a dozen goals it was not for a lack of chances. The team itself was turned topsy-turvy, thereby becoming completely demoralised - back men forward, and forwards back - the result being that half of those who were forward could not kick goals when they had the opportunity, and half of those who were back could not repell a good attack when it was made. What a joke it would have been, and what a wholesome lesson to the captain, if Rickards and Sleight (Albert Park players) had availed themselves of their chances, especially as these were got from the only rushes that ever went over the centre." L. Bracken, Coulthard, Donaldson, Ford, Gardiner, Goer, Gunn, Henry, Kelly, McGill, McMichael, Monie, Murphy, Nudd, G. Robertson, J. Robertson, Rickards, Smith, Turnbull, Waldron. Players mentioned; (17) Gardiner, Smith, Kelly, McMichael, Henry, Murphy, Gunn, Turnbull, Rickards ( John Rickards played for A.Pk. ), McGill, Bracken, Coulthard, Monie, G. Robertson, J. Robertson, Waldron, Nudd. Carlton Reserves played Geelong on the Argyle ground Geelong. The Blues were captained by Prevot, who won the toss and kicked with the wind.
.*The Geelong Advertiser credited the goal to N. Muir. In Adelaide, a South Australian team made up of locally born players played a team made up of Victorians who were living in the colony. The "Victorian" team included former Blues, George D. Kennedy, Kirk Kennedy, Billy Dedman, and Sam A. Wallace. Carlton played a Hawthorn (25) at Grace Park, Hawthorn. The Blues met at Cavanagh's Hotel at 2pm. Gunn, McGill, Donaldson, McMichael, Monie did not play. Their places were filled by Second Twenty players. Coulthard met Meaney of Hawthorn with a "hip and thigh" and with one of his irresistible rushes took the ball down the ground where Henry passed the ball back to Coulthard which he marked, and with a fine place kick scored the Blues first goal. Coulthard again carried the ball the full length of the ground only to see his kick go over the top of the post. Bracken, Brendall, Coulthard, Donaldson, Donovan, Ford, Gardiner, Goer, Henry, Kelly, Tom Kendall, Monie, Murphy, McMichael, Nudd, Rickards, G. Robertson, Smith, Turnbull, Waldron. Two more goals were claimed by the Blues but the Hawthorn goal umpire would not allow them. Players mentioned; Gardiner, Kelly, Smith, Coulthard, Nudd, Henry, Bracken, Ford, Goer, Turnbull, Rickards. Carlton Reserves/Second Twenty played Hotham United at Royal Park. Bell, Brookes, Broach, Burrows, Brendall, Cooper, Donovan, Hogan, Johnstone, Knowles, Lewis, Long, Meaney, Moody, Muir, Muir, O'Brien, Prevot, Prunty, Robin, Sidley, Sutherland, E. Walters, Wishart, Woods. "An interesting contest took place. Albert-park were very clever at at little marking, and seemed to have taken lessons from Carlton." Hotham was now holds second place after defeating Melbourne. Hotham had use of the breeze in the first half, but could not make the best use of it. The Blues defence was resolute, Gardiner kept some of his best players on the back line, and Hotham only had a few scoring opportunities. Carlton missed many chances and scored many behinds. Hotham's goal was first kicked against the Blues in 8 Victorian matches. L. Bracken, Coulthard, Donovan, Ford, Gardiner, Goer, Gunn, Henry, "Hercules" Kelly, McGill, McMichael, Monie, Murphy, Nudd, Rickards, Robertson, Robertson, Smith, Turnbull, Waldron. Best; Gunn, Gardiner, Donovan, and Goer. Carlton F. C. held it's annual concert and ball at the Orderly Room at 8pm. Carlton played Melbourne at the Metropolitan (Melbourne) ground Yarra Park. Melbourne trying to avenge this years two defeats have undergone severe training in the two weeks leading up to this match. The ground was enclosed by new picket fence. The gravel surface made the spills very painfull, and The Australasian reporter said that the ground could do with some levelling and top dressing. Gardiner won the toss, and the Blues kicked with a south westerly wind to the eastern goal. Play commenced just after 3pm. A slightly rough game, but very fast. Donovan clashed with Johnson of Melbourne and Johnson dislocated his collar bone and took no further part in the game. Melbourne were reduced to 19 men. J. Robertson had a habit of getting in the way of the ball which was considered unfair and bought unfavourable comment. Melbourne scored the equaliser in the dying seconds when McDonald place-kicked a 65 yard goal. "...victory was snatched out of the hands of Carlton by Mr. McDonald, of the Melbourne Club, who kicked the ball through the goal-posts at a distance of 65 yards. This feat, we believe, is without parallel in the colonies." The ball went back to the centre when time was called. L. Bracken, Donovan, Ford, Gardiner, Billy Goer, Gunn, Joe Henry, Kelly, Tom Kendall, McMichael, George McGill, Monie, Murphy, Nudd, G. Robertson, J. Robertson, Rickards, Smith, Turnbull, Waldron. Players mentioned; (18) Gardiner, Donovan, J. Robertson, Gunn, Henry, Murphy, Geo. Robertson, McMichael, Goer, Monie, McGill, Waldron, Nudd, Kelly, Rickards, Smith, Ford, L. Bracken. South Adelaide played South Park in Adelaide. Carlton played South Melbourne (25) at the Madeline Street ground. All the Carlton players thought they were forwards and all tried to kick goals, only one succeeded. R. Amess, L. Bracken, Brendall, Donovan, Forde, Gardiner, Goer, Gunn, Henry, Kelly, Tom Kendall, Adam Kennedy, McMichael, Murphy, G. Robertson, J. Robertson, Rickards, Smith, Turnbull, Waldron. Players mentioned; Gardiner, Henry, Bracken, Turnbull. Carlton Reserves played Melbourne Reserves at University Paddock. Bell, Brendall, Broach, Brooks, Burrows, Boston, Drake, Donovan, Hogan, Knowles, Lewis, Long, Moody, Muir, Muir, Prunty, Rafferty, Robin, Rogers, Sidley, Sutherland, Walters, Wishart, Woods. Carlton played St.Kilda at the Madeline Street ground. The Blues won the toss and kicked to the southern goal aided by a strong breeze. The Saints started the match with only 16 men, three more players turned up and they played the match with 19 men on the ground. R. Amess, L. Bracken, Donovan, Ford, Gardiner, Goer, Gunn, Henry, Kelly, Murphy, McGill, McMichael, Nudd, Rickards, G. Robertson, J. Robertson, Smith, Turnbull, Waldron. Blues' half time score given as 3 goals and "about a dozen behinds", St.K behinds not mentioned. Players mentioned; Gardiner, Ford, Gunn, McMichael, Goer, Henry. Carlton played Essendon (25) at the Madeline Street ground. Possibly the first time a Carlton senior team played Essendon. Good luck rather than good football got the Blues over the line against a strong 25 man junior team. Murphy, Bracken and McMichael did not play, their places were taken by Guy, Kendall and O'Brien. Essendon had most of the play in the first half, but Henry got the only goal. The visitors complained about the ball being "dead" and not sufficiently inflated. Amess, Donovan, Ford, Gardiner, Goer, Gunn, Gordon, Henry, Kelly, McGill, McMichael, Monie, Murphy, Nudd, Robertson, Robertson, Rickards, Smith, Turnbull, Waldron. Players mentioned; Gardiner, Henry, Guy, Kendall, O'Brien, Gunn, Nudd, Goer, Kelly, George Robertson. Best; Goer, Kelly, George Robertson, and Guy. Carlton Reserves played Brunswick at Brunswick. Carlton played Barwon at Comunn-na-feine Reserve South Geelong. The Reserve was bounded by Bellarine St. to west, Balliang St. to north, Fyans St. to south, it was turned into a housing estate in 1913, there is still a Comunn-na-feine Hotel in Bellarine Street, South Geelong. The match was to be played for charity and but Barwon had not been able to fence it's ground this season. They proposed the Agricultural Society's show ground, but Carlton objected as it was unsuitable for football. It was on a high hill at one goal, and sloped down to the other. It also sloped to one corner, the Carlton hon. secretary had earlier inspected it and ruled it out. Barwon agreed to change to the ground along side the Comunn-na-feine, and placed the donation boxes accordingly. The Blues were without several of it's players. Coulthard, Monie, L. Bracken, McGill, the Robertsons, Turnbull did not show. 13 players left by train to Geelong. This was the weakest team Carlton had put in the field. For the first time in ten years the Carlton Football Club had been defeated by a provincial team, the last time was by Geelong in 1867! The excuse given was that the Blues only had 13 players, 3 of whom were not fit to play. The Blues' team was made up with substitutes. Donaldson, Amess, W. Bracken, McGibbon, and the Barwon club allowed James Gardiner (Geelong) and Jimmy Wilson (Geelong Imperials) to be added to make up a team of 19. Jimmy Wilson would later become one of the great captains of Geelong. Barwon won the toss and kicked with the wind and scored the only goal in the first hour. Umpire Clayton was also blamed because he failed to pay marks to W. Bracken and Rickards who were within 12 yards of goal. Rickards had taken a mark and was walking back to line up when a Barwon player pounced on him and yelled that he had played on, the umpire threw the ball up. It was said he let the Barwon players off lightly for infringements. The Age said, "for the only two shots they had they were frustrated unfairly by the umpire." The Geelong Advertiser said the umpire was "impartial - throughly knew his duties." While Carlton had lost it's first match for 1877, this match was probably the Barwon club's finest achievement. L. Bracken, W. Bracken, Donovan, Ford, J. Gardiner (Capt. ), Goer, Gordon, Gunn, Henry, Kelly, McGill (Vice Capt. ), Monie, McMichael, Murphy, Nudd, J. Robertson, Rickards, Smith, Turnbull, Waldron. Emergencies; R. Donaldson, R. Amess, Brendall. Charity boxes placed to raise money for the Melbourne Hospital. 62 pounds was donated. The ground was in good condition despite a shower just before play began. The game commenced at 3.10pm. Carlton won the toss and kicked to the southern end. Coulthard returned unexpectedly from N.S.W. The Sydney people who lured him to the colony had failed to keep their promise. He said that he went to Sydney for business considerations "only this, and nothing more." Coulthard in one of his dashing runs covered 100 yards while bouncing the ball. Half a dozen men tackled him and bought him down, but he got up, went on with the ball until he was tackled near the goal. Melbourne playing at their seasons best, had the better of the play for the first two thirds of the match. The Blues did not play with their usual flair and dash. L. Bracken, W. Bracken, Coulthard, Donovan, Ford, Gardiner (Capt. ), Goer, Gordon, Gunn, Henry, Kelly, McGill (Vice Capt. ), McMichael, Monie, Murphy, Nudd, J. Robertson, Rickards, Smith, Turnbull, Waldron. Players mentioned; (19) Coulthard, Goer, Turnbull, McMichael, W. Bracken, Gardiner, McGill, Gunn, Kelly, Henry, Rickards, Nudd, Smith, Murphy, L. Bracken, Donovan, Bill Monie, Waldron, Guy. "The committee of the Carlton Football Club will endeavour to turn to account the athletic sports meeting to be held next Saturday afternoon, in the Madeline-street reserve, for the Indian famine relief fund. To make the programme more attractive, one of the 150 yards handicaps will be thrown open to all comers." "The possession of at least two grounds set apart and enclosed is a matter of congratulation amongst footballers; the Carlton ground, of which permissive occupancy was got from the Catholic body, was in splendid order all through; and the Melbourne ground, which is now enclosed with picket fences, though in vile order regarding the playing space-the club being on "good intentions" list-is also free from the encroachments of spectators. The dons of Alma Mater prevented the Carlton club from charging at the gates, so it appeared at first as if the large debt incurred for improvements to the ground was to hang like a millstone round it's neck, but the public came manfully to the rescue, and their aid, in the shape of offerings at the gates, and has entirely expunged the debt." "The first important event of the season was the establishment of a Football Association, composed of two delegates from each of the senior clubs, to have the control of all intercolonial matches, and to adjudicate upon and supervise all matters connected with the game, and be the final court of appeal in any dispputes that may arise. It's first duty was a revision of the rules, and this it did faithfully and well, but no intercolonial matches, strictly speaking, took place, the one contemplated with South Australia having fallen through owing to lukewarmness on part of the latter,or, perhaps to a split in the camp; so it's duties in this direction were not very onerous, and it's mere existence seems to have settled disputes, as none, I understand, have ever been brought before it." "And now for the clubs, commencing with the metropolitans. I presume the premier position for 1877 must fairly be adjudged the Carlton, which has well maintained it's former prestige playing 21 matches, winning 14, losing 3 (one of them under Rugby rules, which can hardly count) drawing 4, and kicking 56 goals to 11. To this club belongs the honour of sending the first football team to try conclusions in another colony-an example which has since been followed by others." McMichael, follower, fine, hard, honest player, an untiring player who plays for the ball and rarely misses it. Goer and Coulthard, who play quite well forward. Gunn, Murphy, among the best of the wingers. Other Carlton players Pindar mentions are "George and James Robertson, Nudd, Donovan, Smith, Rickards, Kelly, Waldron, Monie, and Turnbull have accquitted themselves very creditably on behalf of the old club." L. Bracken 11 goals (behind Melbourne's C. Baker 12), J. Henry 8, G. Coulthard 7, W. Bracken 6, J. Rickards 5. FIFTH ANNUAL CARLTON SPORTS DAY, AT THE MADELINE STREET GROUND. Messrs. O'Brien starter, Robertson judge assisted by A. Sim, and Gardiner and Donovan making the programme ran smoothly. Messrs. Elliott, Green and Dr. Duncan provided cups. Again the club provided the Challenge Drop Kick event, a trophy of a silver mounted Emu Egg Vase. £45 ($90) raised to help the Indian Famine Relief Fund. Entertainment was provided by Leydin's Carlton District Band. As both Guy and Hoggan claimed the race the committee decided the result. Players from Geelong, Ballarat, St.Kilda, Barwon, Melbourne and other clubs. 1. H. Nudd (Carlton) 71 yards, 2. J. K. Terry (St. Kilda) 67 yards 3. G. Coulthard (Carlton) 67 yards. Albert Park, Barwon, Carlton, Carlton Imperial, East Melbourne, Geelong, Melbourne, North Melbourne, St. Kilda, University. The winner turned up in the person of W. Hall, of Geelong, a player famed for his long drop-kicking. Three kicks each were allowed, and Hall covered the following distances, 64, 65, and 68 yards, his shortest kick being better than anybody else's. In the following year H. Nudd, of Carlton, covered 74 and 71 yards; F. Norris (Lincoln United), 72 yards, while 68 yards were common. Long distance kicking is in the air at the present time, and Nudd's 74 yards will take some beating. Of course, such a lot depends on the day, and whether the wind is favourable. But, nevertheless, a drop kick of 74 yards kicked and measured 51 years ago, shows conclusively that those old pioneers knew the art of kicking. There must have been a reason why drop-kicking was favoured. It might be worth mentioning that George Robertson, who is still with us, one who radiates the atmosphere of those old days, kicked 63.75* yards, third to Nudd's 74 yards." "The football season has passed away, and the returns and statistics of the contests exercise the analytical powers of the writers engaged in summing up the results of the season. The two metropolitan clubs - the Melbourne and Carlton - which have for many years past maintained the leading rank in Victoria, have again maintained their positions. There were four matches between the two during the season, of which Carlton won the first two, the third resulted in a tie, and the fourth ended in favour of Melbourne. As the Carlton won two matches to the Melbourne's one, they have therefore achieved the title of champion club for 1877." "Farewell the sphere of leather that warms the wint'ry toe! Farewell, the friendly battle that sets the veins aglow! Thou glorious soul of mischief, in leathern body pent." the gallant charge, stubborn defence, and wily stratagem. Teams: Melbourne, Albert Park, Hotham, Carlton & St. Kilda. According to The Footballer the Hotham Second Twenty "collapsed" soon after the season began. Melbourne "fell into a drowsy state" then started playing with some endeavour late in the season. Carlton and St. Kilda plodded on in their usual way. "One great drawback to success is a strong desire on the part of the players to follow the fortunes of the first, and after a match or two is neglected, the interest flags, and indifference follows." The Carlton Story. Hugh Buggy and Harry Bell. Pages.40, 41,42, 259. Mullin's Footballers Australian Almanac of 1951 page. 66. The History of the Carlton Football Club. B. Hansen pages. 36,37,38. The Footballer, 1877. p 79, 80, 109. Sydney Morning Herald 1877, June 21 & 26, p5 & 3. The Australasian Sketcher with Pen and Pencil, 1877 editions. Australian Town & Country Journal, N.S.W. 1877 editions. The Telelgraph, StKilda, Prahran, & South Yarra Guardian, 1877 editions. Page last modified on Tuesday 09 of April, 2019 10:52:48 AEST by blueycarlton. 1982 - Fitzy to captain Blues, WA & Vic in same year?? 2002 Rd 1 - Matty Lappin.